– Francois de [Montmorency-]Laval, French bishop of Quebec, Canada (1623-1708). – José de Anchieta, Spanish priest of the Society of Jesus (1534-1597). – Marie de l’Incarnation (née Marie Guyart), French (1599-1672). The new Saints were raised to the altars by a process called “equivalent canonization.” In such cases, the Pope waives the usual judicial process and declares that a Blessed’s liturgical cult is extended to the Universal Church. The same practice was adopted by Pope Francis for the canonization of Angela Foligno (9 October 2013) and Peter Faber (17 December 2013). when such a saint has been from a remote period the object of veneration, when his heroic virtues (or martyrdom) and miracles are related by reliable historians, and the fame of his miraculous intercession is uninterrupted. It is noteworthy that all three Saints canonized by Pope Francis on April 3, 2014, had been beatified by his predecessor, Bl. John Paul II early in his pontificate on June 20, 1980, together with two other Blesseds from the New World: Pedro de Betancur (who was later canonized on July 30, 2002, in Guatemala) and Kateri Tekakwitha (who was canonized on October 21, 2012, by Pope Benedict XVI). All five of them lived in the late sixteenth or seventeenth century and, with the exception of St. Kateri, a native American, were European missionaries to North America. 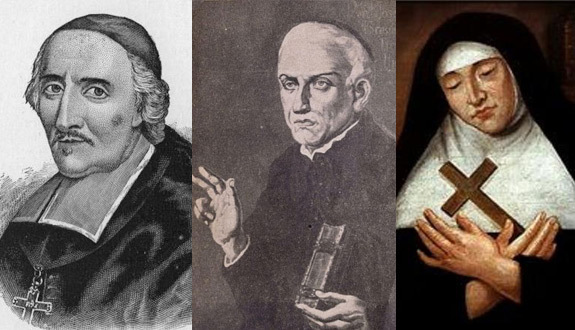 Chapter-length biographies of these five Saints of the Americas can be found in New Saints and Blesseds of the Catholic Church: 1979-1983 by Msgr. Ferdinand Holböck (San Francisco: Ignatius Press, 2000). Brasilia, 4 April 2014 (VIS) – San José de Anchieta…, known as the “Apostle of Brazil”, … was declared “Patron of the catechists” by the National Conference of Brazilian Bishops…. Throughout Brazil, the news was greeted with great celebration: the first request for his canonization was made 417 years ago. The Archbishop of Aparecida and Chairman of the CNBB, Cardinal Raymundo Damasceno Assis, in a statement points out the importance of San José de Anchieta’s life and mission. “He taught us that in order for the Gospel to be announced, it must be acculturated, taking into account the culture of the people to whom it is intended” says Cardinal Damasceno…. José de Anchieta … was born in La Laguna [on the Island of Tenerife, Spain] in March 1534. He studied in Portugal, where he developed a religious vocation. He moved to Brazil in 1553, where he remained for 44 years…. He also had a great devotion to Mary and dedicated all his forces to defend the rights of the indigenous.